Rapid development in emerging economies, especially in automotive, metal processing, chemical and oil & gas sectors will drive heat transfer fluid market growth. The increasing necessity for maintaining temperature in these sectors will be a major factor responsible for heat transfer fluid demand. The excess of warmness and energy is utilized in major industrial sectors including, HVAC, chemical and concentrated solar power plants. Rising demand for specific application based HTF for optimum energy efficiency is expected to propel industry growth. Further, elevated temperature control properties and cost saving operation compared to its counterparts including, steam and electric will support product penetration. Implementation of CSP facilities in industrialized countries to promote renewable energies will also propel heat transfer fluid market size. Favourable thermal properties along with high temperature holding capabilities of the product has enhanced the industry demand. Solar energy is the most cost-efficient source of power generation along with reduced levels of carbon emissions. Enhanced longevity, high thermal storage and concentrated power are the key factors enhancing the CSPs over conventional PV solar panels. Increasing natural gas production particularly in Gulf Cooperation Council (GCC) will drive industry growth. Growth in natural gas production will lead to increase in demand for synthetic lubricants including HTFs. Oil refineries use the product for warming and distillation of oil and oil-based products. Shifting preference from traditional water or steam systems towards the thermal liquid systems in several industries will drive the business growth of heat transfer fluid market. Replacement of traditional steam systems with heat transfer fluid system is expected to drive the product demand. High temperature control, environmental safety, production efficiency and low maintenance are the key driving properties of heat transfer fluid market. Factors including, stringent environment regulations and unstable raw material supply owing to fluctuating crude oil & base oil production will impact heat transfer fluid market price trend. However, increasing penetration of bio based and biodegradable product is expected to create new avenues for industry participants. Silicone & aromatics will be valued over USD 1.5 billion by 2024. The industry demand in this segment is projected to be driven by its extensively used in industries where processes require a very high temperature such as plastics, spin and weave, wood processing, chemical and food. Factors such as high thermal stability, better physical & chemical resistance to change when exposed to elevated temperatures along with oxidation conditions will support product penetration over the forecast period. Ongoing technological development in manufacturing sectors such as metal processing, automotive and plastics will propel product demand. Mineral oils segment of heat transfer fluid market will witness gains at 6% up to 2024. Increasing demand in various applications including manufacturing processes, pharmaceutical & chemicals, refrigeration, CSP generation and geothermal energy is expected to enhance the demand for mineral oil based product. Mineral oil is usually priced reasonably compared to other products and thereby, becoming popular amongst the cost sensitive customers worldwide. Glycol is estimated to register over 90 kilo tons by 2024. This segment is anticipated to register significant gains owing to excellent antifreeze properties. 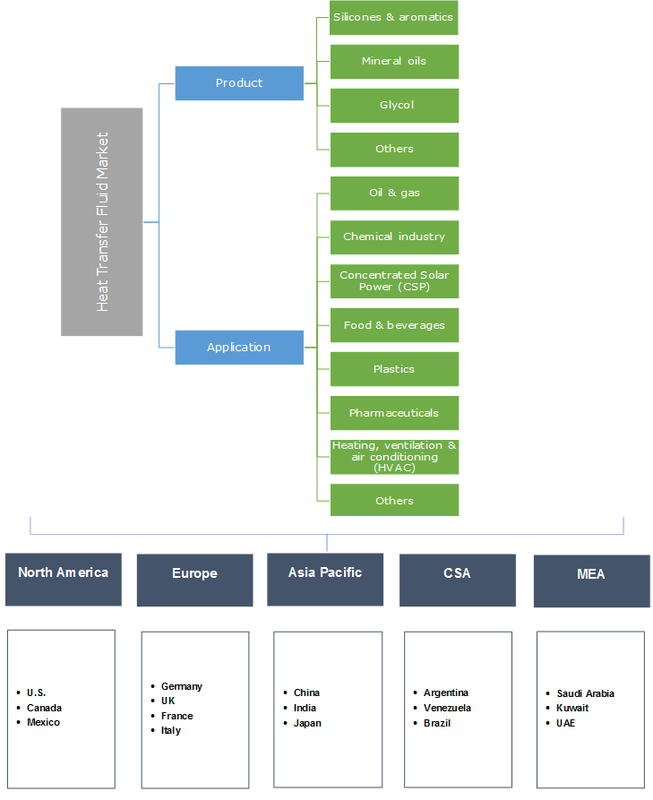 Potential application outlook as an antifreeze in food & beverage industry will boost heat transfer fluid market size. Further, the rising food & beverage industry mainly in Asia Pacific region is projected to fuel product demand over the forecast period. Increasing number of food processing facilities along with enhancing capacities for medical segments are expected to boost the demand for glycol over the forecast period. Oil & gas application segment of heat transfer fluid market will be worth over USD 870 million by 2024. Rising application of product for warming oils for offshore oil & gas thermal processes is expected to propel the market size over the forecast period. In addition, setting up of new LNG terminals is likely to fuel product demand. New oil & gas exploration projects in Europe and Asia Pacific region is anticipated to drive product demand over the projected timeframe. Chemical industry was valued at over USD 250 million in 2016. This industry uses the product in various processes including, warming & cooling, fine chemical batch processing and waste heat recovery. The product is also used for indirect warming of polymers, energy recovery, pipeline tracking, low pressure cogeneration, warming & drying of bulk materials and gas processing. Concentrated solar power (CSP) will grow at over 7% up to 2024. The product is widely utilized for storage and transfer of thermal energy in concentrating solar power systems. Rapid development of CSP industry mainly Asia Pacific region for promoting renewable energy is expected to drive industry growth. Europe heat transfer fluid market accounted for more than 30% of total industry share in 2016. Rising population coupled with increasing energy demand has propelled the power and energy sector growth. Ongoing construction of new solar plants along with existing demand in industrial sectors including, automotive and metal processing is anticipated to drive the industry demand in the regions. Stringent environment regulations in Europe coupled with unstable supply of crude oil, base oils will encourage development of bio-based or biodegradable heat transfer fluids. The regional market will provide lucrative opportunities for industry participants over the projected timeframe. APAC heat transfer fluid market was valued at over USD 550 million in 2016. Rising demand for thermal management coupled with promotion of renewal energy in China and Japan is expected to drive the HTF demand. Increasing energy demand from various industrial sectors will propel development of new solar plants. This is expected to surge the industry demand in Asia Pacific. North America heat transfer fluid market will witness gains at 6.3% up to 2024. Increasing necessity to utilize excess of warmness and energy released during processes in major industries such as chemical, concentrated solar power plants and HVAC will drive heat transfer fluid market over the forecast period. Global industry share is consolidated with British Petroleum, Shell, ExxonMobil and Dow Chemical catering to the key industry demands. Other prominent players include, Dynalene, Indian Oil Corporation Ltd. (IOCL), Hindustan Petroleum Corporation Ltd. (HPCL), Eastman Chemical Company, CFR Chemicals, Inlet Petroleum Company (IPC) and Huntsman Corporation. Mergers & acquisitions, expansion of the production capacity, joint venture coupled with product portfolio expansion & agreements are major strategies adopted by the industry players. Companies have been investigating to commercialize the nanofluids in combination with conventional synthetic oils to improve thermal properties of the resultant fluid. Technological advancements along with development of multi-utility oils are estimated to create new avenues for future development. Heat transfer fluid (HTF) is a liquid or a gas, used for transporting warmth from one component to another in various processes that requires cooling or warming up for maintaining constant temperature. Various properties of the product include low toxicity & viscosity and high thermal conductivity & flash point. Research & development for heat transfer fluid market has grown rapidly in past few years. Several industry manufacturers are focusing on the wide scale usage of mineral-based transformer oil in circuit breakers, switchgear, distribution transformers and other power equipment. This oil is priced reasonably compared to other product segments and is therefore well recognized among cost sensitive buyers across the globe.